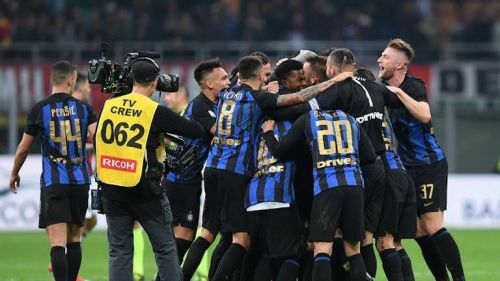 Inter Milan did the league double over crosstown rivals AC Milan for the first time since 2012 after an entertaining 3-2 win at the San Siro. Matias Vecino broke the deadlock as early as the third minute before Stefan De Virj doubled the cushion shortly after the match reconvened. Bakayoko then halved the deficit with a similarly headed strike but Martinez put the tie beyond Milan's reach with a penalty midway through the second stanza. Unlike most of the recent Milan derbies, this one turned out to be an end-to-end contest with chances flying in at either end. Musacchio then reduced the gap to just a single goal again to round off an enthralling goal-fest. Inter's victory propels them back to third with 53 points from 28 games as the Rossoneri's are condemned to fourth again. Here are the hits and flops from the Derby. 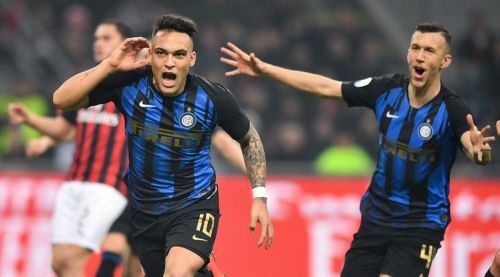 With Mauro Icardi banished mercilessly to a footballing cornfield, the Nerazzurri's needed someone to step up to the plate and cement the void. Enter Lautaro Martinez. The Argentine, despite a promising pre-season tour, was kept waiting in the wings but now seems liberated on been given a chance. He started as the centre-forward again and turned in an incredible performance with a goal and an assist to his name: Martinez intelligently nodded Ivan Perisic's long ball into the path of Vecino who did the rest, before converting from the spot in the second half to all but seal the victory. The 21-year old youngster proved to be an immense attacking presence, harrying his markers for the ball and wreaking havoc with his movements. He also laid two key passes on the night; completed a dribble too. Besides, Martinez wasn't dispossessed even once, a testament to his might on the ball. His only downside was poor passing as he misplaced a few in some good areas and had only 64% pass success overall.